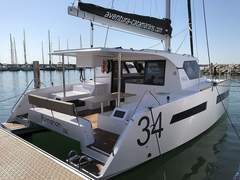 Norpol Yachting is pleased to present the brand new Aventura 34 sailing catamaran, designed by Samer Lasta, this new model has very modern lines and a beautiful and spacious interior. 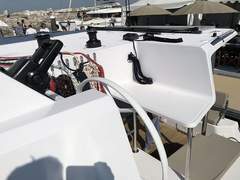 The new photos show the new sailing catamarans exterior and interior. 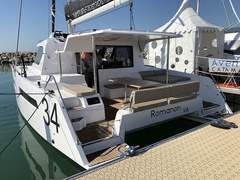 Being a new design with roots in the old 33-footer, the interior volume has increased with additional light through large topside windows, The interior furnishings has been greatly improved. This boat has wheel steering, higher rooftop above the cockpit and better access to the cockpit from the aft platforms. 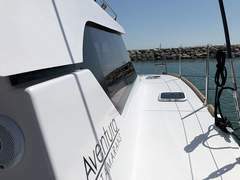 Seven boats sold off plans already. 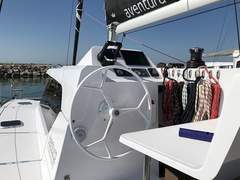 An immediate success for Aventutra Catamarans as they renew their range. 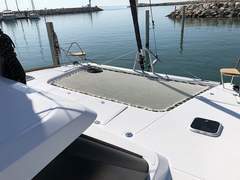 Launching of boat number one took place April 2018. More information available by phone or email.